The fairy who gave life to Pinocchio and apointed Jiminy his conscience. "You see, Pinocchio? A lie keeps growing and growing, until it's as plain as the nose on your face." 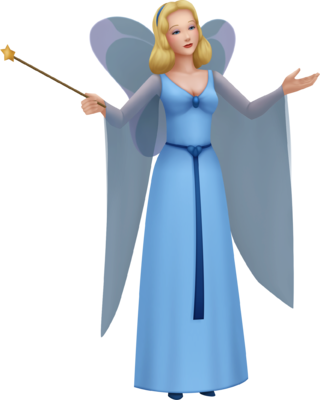 The Blue Fairy is a character that appears in Kingdom Hearts 3D: Dream Drop Distance, originally from the film Pinocchio. She is the fairy who gives Pinocchio life, and eventually makes him a real boy. Prior to Sora's arrival at Prankster's Paradise, the Blue Fairy appears before Jiminy Cricket and Pinocchio, whose nose has become longer since he was lying to Jiminy. After scolding the puppet, she reverts his nose back to normal, but warns that this is the last time she can help him. Later on, the Blue Fairy encounters Sora and advises him go to save Geppetto from Monstro. The Blue Fairy has a kind and gentle expression. She has flip-styled neck-long blonde hair and wears a blue headband. She wears a light blue dress, true to her name. The dress sports long translucent sleeves that have fabric hanging below, a long blue ribbon tied around the waist with a tied heart as the buckle. There's also a blue, oval pendant placed in the cleavage. The Blue Fairy wears blue shoes and has two wings on her back, she also carries a wand with a yellow star at the top end of it. The Blue Fairy is concerned about teaching Pinocchio moral values, as well as for Geppetto's safety. "Little puppet made of pine, wake. The gift of life is thine." —The Blue Fairy grants Pinocchio life. The Blue Fairy originates from Carlo Collodi's book, The Adventures of Pinocchio from 1881. She was known as "The Fairy with Turquoise Hair" from the book, and was later dubbed as the "Blue Fairy" from Disney's 1940 animated movie, Pinocchio. In the movie, the Blue Fairy appears at the night after the carpenter Geppetto had finished making a puppet, Pinocchio. The Blue Fairy appears to grant Geppetto's wish, to make Pinocchio a little boy, but she only made Pinocchio a living puppet, and tells him he will become a real boy only if he is brave, truthful and unselfish and able to tell right from wrong by listening to his conscience. She then asks Jiminy Cricket to become Pinocchio's conscience. She also makes sure that when Pinocchio lies, his nose grows. She later appears near the end of the movie to make Pinocchio a true boy after meeting the criteria she had mentioned before.